William Blake has characterised Albion as the ‘Human Form Divine’ and ‘The Angel of the Presence’. Blake ‘saw’ Albion sleeping but now is close to waking stirred by the questing of modern pilgrimage. Kathleen Raine, that wonderful poet, seer and co-founder of The Temenos Academy, wrote that King Arthur and Albion are ‘England’s determining archetype’ viewed as a Sleeping King. Thus, ancient and holy sites have to be awakened, healed, treated with respect and co-creatively held in love. Such a place is Chalice Well, nestling in the valley at the foot of Glastonbury Tor. This ancient well has poured forth its iron-heavy waters at a constant rate of 112,000 litres a day for century upon century and at a constant temperature of 11 degrees Celsius. It has been called the Red Spring, the Blood Well and the Chalice Well. Now surrounded by beautiful and well maintained gardens the site has been cared for by a Trust since 1959 (set up by Wellesley Tudor Pole); before that by the remarkable Alice Buckton and before that by the Sacred Missionaries of the Heart from France. It is now known as a ‘living sanctuary’ because of its constant use as a place of pilgrimage for all spiritual paths and people of goodwill. It is open to the public 364 days a year and now follows the Wheel of the Year celebrations at solstices, equinoxes and quarter days with meditation and silence at the Wellhead eight times a year. 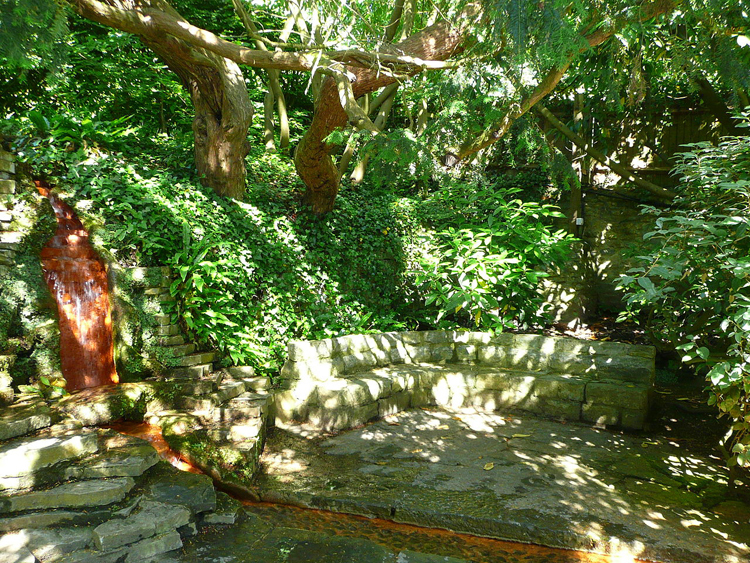 Sir George Trevelyan pointed out that at Chalice Well inner transformation is the task; body, soul and spirit. Supporters are called Companions and they can stay in the retreat house, Little St Michaels, on site. If possible, park in town and walk the few hundred yards (‘on the pilgrim’s way they trod’) to the Chalice Well and the Tor along Chilkwell Street, now unfortunately a Euro route, which by some miracle, doesn’t seem to impact on the special atmospheres of the Well and the Tor. Location: Limited accessible parking at the Well so use one of Glastonbury’s car parks. It is a ten to twelve minute walk from the centre of town.